In the book of Deuteronomy, a book of the Bible that most people skip, God explains his relationship to his people. He starts by saying that he didn’t choose them because of their numbers or greatness as a nation. In fact, they started out as the smallest of all peoples. It was just Abraham and Sarah when God chose them. Instead he chose them because he loved them. And he continues to choose them because he made a promise to them, and he keeps his promises. His love lasts over the centuries, despite their unfaithfulness to him and in the many ways they reject him over and over. We can take great comfort in this. The people of Israel didn’t need to earn God’s love and attention. He gave it to them freely. In the same way, there’s nothing we need to do to earn his affection. We don’t need to do good things, love others, or even obey his commands to gain God’s love. Instead, he loved us first, and in response we may opt to react to his love by doing things that please him. Too often, we get this backwards. We don’t behave better to earn God’s love; we behave better because he loves us. We often get this backwards, too. We assume that when we mess up, he will withhold his love and punish us. Yes, sometimes there are consequences for what we do—punishment, if you will—but this is a result of his love and not the withdrawal of it. 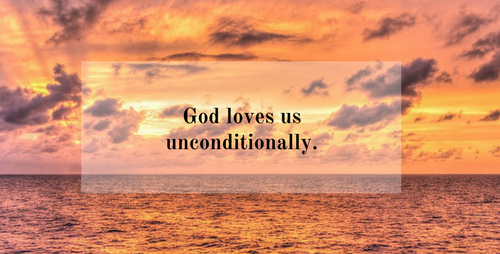 God loves us unconditionally, even if this is hard for us to comprehend.